Location: Coaley Village Hall , GL11 5LG and at the National Plant Collection® of Agapanthus held by Mike Grimshaw. The day will start from 10am with tea and coffee at Coaley Village Hall with speakers including Christine Skelmersdale and Bob Brown from 11am. After lunch, there will be a visit to the National Plant Collection® of Agapanthus (pre-2005 cvs.) about 3 miles from the village hall. The National Collection consists of 226 pre 2005 cultivars and there are another 200 cultivars in the garden. National Collection Holder Mike Grimshaw will give a propagation demonstration. Plant sales in Coaley Village Hall with Cotswold Garden Flowers and other nurseries present and plants propagated from the National Plant Collection as well as members’ plant sales. Booking essential by July 26th 2019—contact Malcolm Allison. Or, to purchase tickets from the Online Store, click here. September 28th, 29th: Malvern Autumn Show, where our Society is again exhibiting. Saturday, October 5th: Bickham House and Cottage gardens (Steve Eyre) (open Sunday October 6th under NGS). 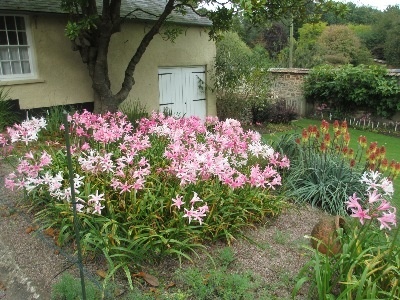 Plant Heritage Guernsey Nerine Festival: Saturday, 5th October - Saturday, 19th October open 14:30 - 16:00 (5th Oct), 10:00 - 16:00 (6th - 19th Oct) at the Lower Candie Gardens, St Peter Port, Guernsey. 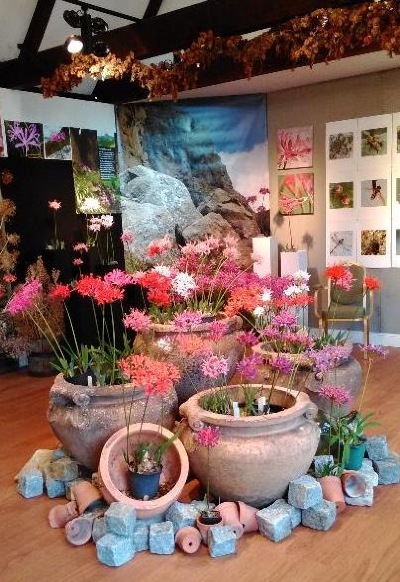 Saturday, October 12th: Society visit to the Five Arrows Gallery, Exbury and the Nerine glasshouse. Sunday, October 13th: Society visit to the Isle of Wight. November 2nd: Annual General Meeting, Holton Village Hall, Oxfordshire. Speaker Jonathan Hutchinson, National Plant Collection holder for Scadoxus, who will talk about his plant hunting trip to Zimbabwe. This is definitely one of the most complicated flowers I've painted but the flowers are so beautiful it's worth persevering. 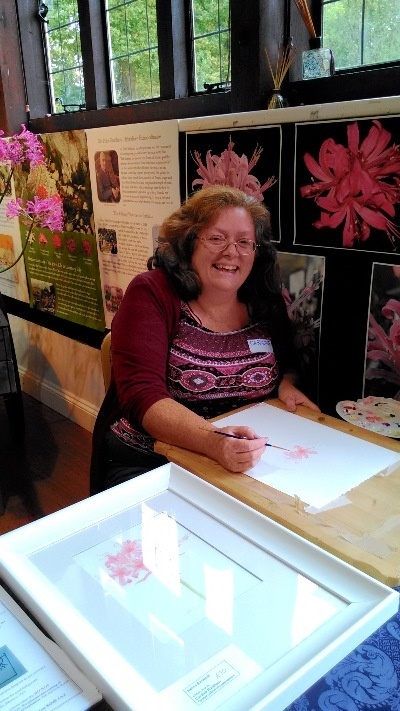 Caroline was working in the Five Arrows Gallery in 2017 producing wonderfully delicate and meticulously rendered water colour paintings.